What to do when given a black truffle? At first I thought it deserved fresh pasta, or freshly scrambled, organic eggs. 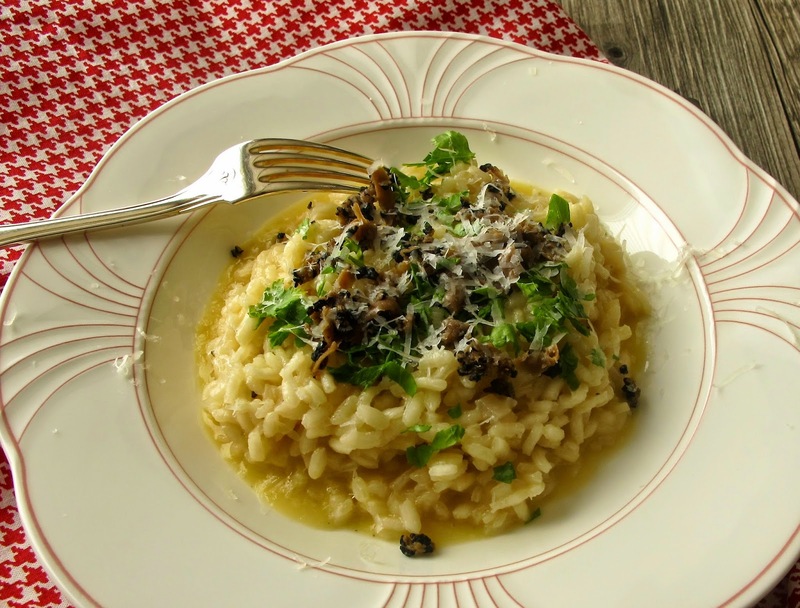 But in the end, truffle was grated over risotto dusted with Parmesan. While my friend Melody was visiting the beautiful Orvieto in Umbria, one of the treasures she returned with, were black truffles. The truffle is a type of fungi, with a very distinct aroma and flavor, I swoon when I am near it! This is a basic risotto, with Black Truffle, the star. In a medium saucepan over low heat, bring the stock to a light simmer. In a large saute pan, heat a tablespoon of butter and olive oil, add shallot and stir until softened. Add rice to the pan, garlic, and salt. When the rice has a little dot that comes out in the center, add the wine. Add a ladle of chicken stock and stir. Keep adding stock after the previous amount of stock has been absorbed. This should take about 20-25 minutes. Stir in remaining tablespoon of butter. Remove pan with risotto from heat. Spoon risotto into two serving bowls. Top with a dusting of Parmesan, if desired. Sprinkle the parsley over each dish, and grate the truffle on top. Indulge.